Plastic comb binding is a traditional, economical, and simple binding method that is used in a variety of industries from personal use, to education, to marketing. The binding spines are known as plastic combs, which are made of plastic and consists of nineteen round rings that easily spread open for sheet inserting. Plastic comb binding is very popular for user and instruction manuals, cookbooks, proposals, children’s books, presentations, and more. Some advantages that plastic comb binding has over other binding methods making it readily available from a variety of outlets, it is inexpensive, it can be custom imprinted, it can be easily edited, it has a wide range of sizes and colors available, and it allows for perfect registration where the pages align evenly. The Akiles MegaBind-1 gives you the control you need for your book binding needs. The MegaBind-1 features an adjustable side guide which allows you to align the paper for the best punch for documents up to 2″ thick. The MegaBind has disengaging punch pins which allow for precision punching on any binding edge up to 14″. The Electric Akiles Megabind-1 is perfect for high-volume usage in the office or production facility. The maximum binding capacity is 3/16” to 2”, and punches up to 5,000 sheets of paper per hour. The MegaBind-1 also binds up to 250 books per hour with a maximum length capacity of 24 rings. The Megabind-1 Binder features a single handle and foot-pedal system that allows you to punch and bind simultaneously or independently. The foot pedal punching activation allows you to use both hands freely to hold your sheets in place, or pull the handle and close the combs of another book. In addition to these great features, the Akiles Megabind-1 Binding Machine features a diameter guide to help you select the correct comb size based on the thickness of your book, and a margin depth guide, allowing you choose between three settings of margin depth. The Megabind-1 measures 17″ x 15.5″ x 10.5″, and only weighs about 31 lbs allowing it to fit on almost any table or countertop for convenience. The Megabind-1 Comb binder is proven to be extremely durable and dependable and it comes standard with a one year manufacturer’s warranty! If you have any questions or are interested in purchasing the Akiles MegaBind-1, visit us at SpiralBinding.com. 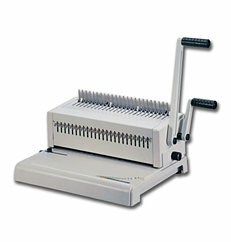 We have great pricing on a full line of Plastic Comb Binding Machines. Call us at 1-800-631-3572 for more information!